Barbarea.vulgaris.Merel R. Black.Robert W. Freckmann Herbarium, University of Wisconsin-Stevens Point. wisplants.uwsp.edu. (Accessed 5/2014). Barbarea vulgaris is a biennial or short-lived bitter perennial herb, 20-80 cm tall, erect from a taproot to 50 cm deep, secondary root system fibrous, extensive, initially forming an overwintering rosette, which can grow at temperatures below 5° C, flowering stems one to several, branched above, stem with 8 ridges, dark green. Barbarea vulgaris winter rosette. By Arthur Haines. Copyright © 2017. New England Wild Flower Society. gobotany.newenglandwild.org (Accessed 10/2017). Leaves alternate, winter rosette leaves pinnately lobed, terminal lobe larger than laterals, rounded, to 10 cm diameter, leaf stalk, including rachis, to 20 cm long, stem leaves clasping, progressively reduced, upper leaves merely toothed; plants generally produce a flowering stalk (bolt) their second spring when temperatures exceed 10° C (MacDonald and Cavers 1991). Barbarea vulgaris flowers. commons.wikimedia.org (Accessed 10/2017). Flowers yellow, regular, 4 petals about 0.8 cm long, 0.2 cm wide, widest above middle, blooming progressively upwards, initially crowded at the top of a spike-like flower stalks with fruit developing below as the stalk elongates. Primarily outcrossing, insect pollinated, visited mostly by bees, both the European honeybee, Apis mellifera , and native bees (Mulligan and Kevan 1973), blooming and fruiting April-June. Barbarea vulgaris fruit. By Arthur Haines. Copyright © 2017. New England Wild Flower Society. gobotany.newenglandwild.org (Accessed 10/2017). Fruit dry, pods linear, to 4 cm long, erect, tip beaked, splitting open from base to release 1-20 seeds, 0.1 cm; seed production estimated as high as 116,000 per plant; seeds dispersed short distances by the explosive dehiscence of the capsule (silique) valves. Frequency in NYC: Occasional in NYC but a common in agricultural areas of NJ. Habitat: Early spring plant in open areas, roadsides, vacant lots, fields. Notes: Seeds can pass unharmed through many animals including rabbits and can remain dormant in soil for up to 20 years (MacDonald and Cavers 1991). Seedlings usually germinate the following spring or summer when days are at least 14 hrs long and warm to 25° C. Only rosettes with five or more leaves are able to produce flowering stalks. 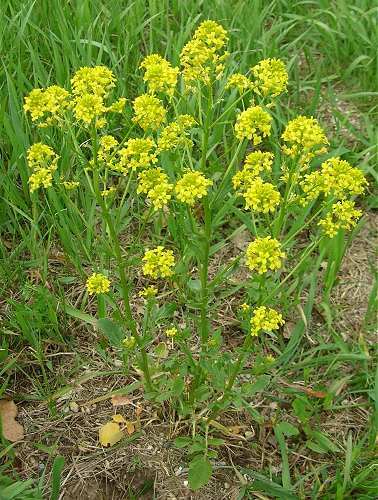 Barbarea vulgaris produces several mustard oils (isothiocynates) typical of other Brassicaceae including: sinigrin, glucocapparin, gluconasturtiin and glucobarbarin. All apparently produced in small amounts. These are compounds used by flea beetles (Alticinae) to locate their host plants. 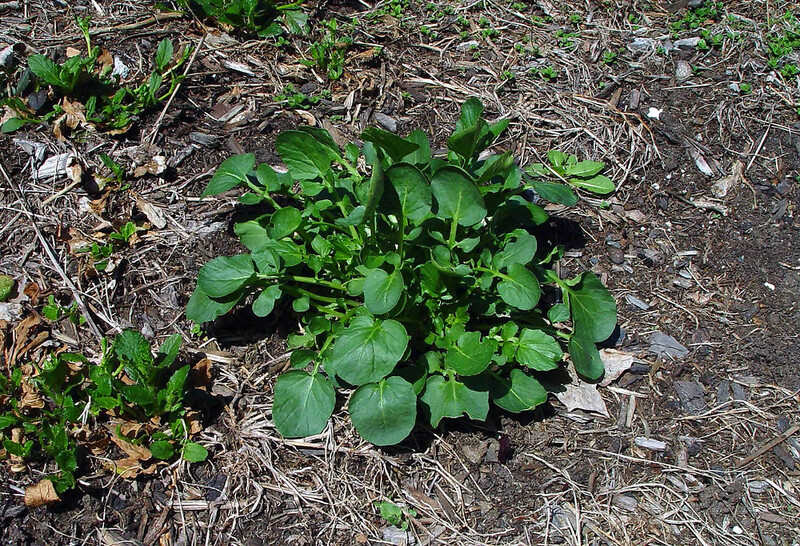 Rosette leaves edible as greens. The sinigrin contributes a tangy flavor (Kingsbury 1964; White 1983; MacDonald and Cavers 1991). Rosettes tolerant of dry to wet soil, prefers rich, moist, disturbed soil pH 7-7.6. Intolerant of shade. New rosettes susceptible to slug predation. Insects that prey on yellow rocket include the aphids, Brevicoryne brassicae, Aphis nasturtii; the black cut-worm moth Agrotis ipsilon; the cabbage maggot, Hylemya brassicae; larvae of the falcate orangetip butterfly, Anthocharis midea (Pieridae) (Tallamy 2003; Pyle 1981); the cabbage white butterflies Pieris rapae and P. brassicae (Pieridae) and a number of flea beetles including; Phyllotreta cruciferae, P. striolata, P. bipustulata, P zimmermanni (Chrysomelidae); Psylloides napi, P. chrysocephala, P. punctulata and P. cuprea (Chrysomelidae); and the root-knot nematode Meloidogyne hapla. 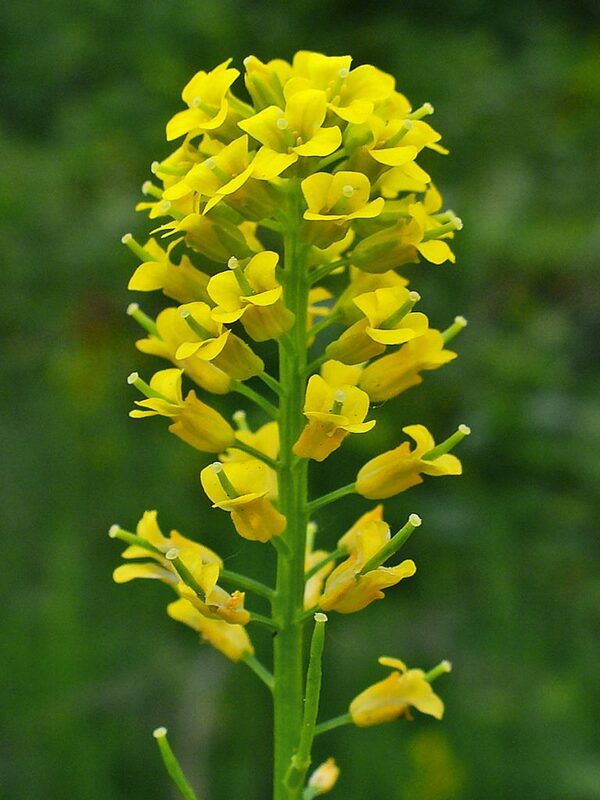 Yellow Rocket is also host to various fungal diseases including; stem rot Xanthomonas barbareae, black rot, Ruga verrucosans, the downy mildew, Ramularia barbareae and the leaf spot Cercospora barbarea. It is also host to several viruses including Plasmodiophora brassicae (MacDonald and Cavers 1991; White 1983).